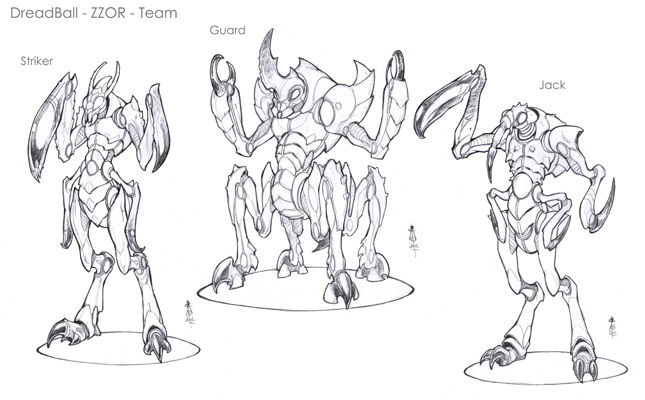 DreadBall Season 2 Design Theory: Bugs! Are Z’zor evil or are they just misunderstood? It’s not easy to tell, and their peculiar noises and movements don’t fill the average human with any sense of comfort or warmth. This makes them perfect “bad guys” in the spectacle of a DreadBall arena. On paper, the Z’zor team initially looks the least peculiar of the four new teams for Season 2. With a different stat line for each player role they are a bit harder for me to remember, but that’s not a big difference. What does start to make them interesting is that they all start with Can’t Feel A Thing because of their hardened carapaces. That’s pretty useful, especially as a team-wide ability. The models you put on the pitch are much more likely to stay there. Z’zor Jacks also have a new ability called Slide. This allows them to make Dash attempts on any action which allows them at least 1 hex of movement. This probably doesn’t sound like much, but think about it. No longer are they limited to just a single step and Slam or Throw. Now they can Slide a little further, and with a 4+ Speed they have a fair chance of going at least a second hex before they do their thing. Even this small difference gives them a much bigger range of influence on the pitch and can make a pretty big difference to their flexibility. Incidentally, this skill is now available to all Jacks on the new Advancement Tables included in Season 2. Better Jacks is a good thing because the Z’zor Strikers aren’t that great. The problem is their 5+ Skill. However, they are still Strikers at the end of the day and so they get all the bonuses for that role. And don’t forget that they have the extra resilience to damage so they’re harder for the opposing team to sack. With a degree of resilience spread across the whole team, the Z’zor only start with one dedicated Guard – but he’s pretty impressive. He has the same stats as an Orx Guard, which puts him in the top tier to start with. On top of that he has Can’t Feel A Thing like the rest of his team, plus Steady. Scared yet? All of these subtle differences combine to make a team which needs a different style of play. Their ability to both smash the opposition and move the ball around is less concentrated in the specialist roles than usual, as is their survivability. For this reason it’s a team with a great deal of flexibility and ability to adapt to a changing game. Expect to score more with your Jacks than usual, and also to Slam with them more. As I’ve said a few times before, this is a subtle team to get the best from, as befits this new level of tactical challenge in Season 2. Whether this suits you personally or not is up to you to decide. I think all of these Season 2 teams will be more Marmite than the core teams, but no less balanced for that. They just get a bit more getting used to, that’s all. But what do you expect from a bunch of bugs? 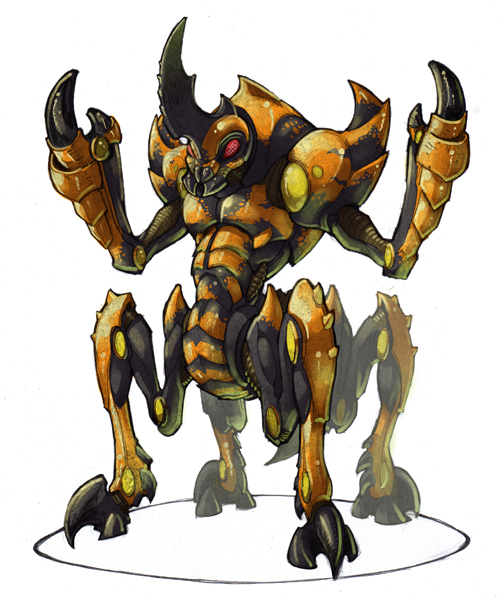 15 Responses to DreadBall Season 2 Design Theory: Bugs! I cant get enough of this stuff. Slide is huge and very nice to have. I think it would be the best skill on any jack but a FF. I look forward to try these guy (my second favourite as concept after my beloved teratons). I like explaining Slide to veteran Coaches in person as you often get to watch the potential impact dawning on their face as they go from an initial “Huh, is that it?” to “Oh my!”. The more you think about it, the more of a game changer it is. Hmmm, slide combined with stretch could make dashing worth attempting for FF jacks. Although I understand that stats on paper aren’t played the same as on the actual pitch, I’m a bit concerned about game balance in that Trontek 29ers seem to have the upper hand by far according to the Dreadball Database: winning 66,8% of the time over 256 games, which is also the sum of my play experience playing Orx against my 9 year old son’s 29ers. With Strikers at 4+ skill and the ability to make 4 point strikes easily, those buggers are extremely hard to beat if the coach spends all the coaching dice he can to make those scores, something a coach can do on two consecutive turns with some bt of strategy. The Dreadball Database, in this light, indicates that over 256 games the Trontek win on average by 4.4 points, meaning that a series of 3 or 4 point strikes is the sure key to victory with this team. Considering the hard time Orx have against the Trontek 29ers, I have a hard time understanding how the Z’zor could ever hope to beat them with a single guard, since a Z’zor Jack needs to be very lucky to lay low a Trontek Striker with 4+ in every stat and, as stated, Z’zor strikers will score much less often than them with their 5+ skill. Though I see that the Z’zor are meant to stay on the pitch, I’m perplexed at just how they’re supposed to work to get those 7 points to win the game. Alll things being equal, they don’t seem to be very good to strike points with their poor Strikers and their single Guard makes them unlikely to take out enemy Strikers (who have +1 dice when they dodge). Since their Jacks, even with Slide, remain inferior to specialists in other teams (having one die less to slam or strike, and less mobility than specialists), I’m quite puzzled at how they can be used to score points. The Z’zor do seem quite resilient, but more passive than the other teams, being overall poorer at slamming and striking. Specifically, in that light, and without practice on the pitch with the Z’zor to test that theory of course, wouldn’t it be an easy win for the Trontek (and maybe the Veermyn) just to ignore the Z’zor and run to score as much as they can with their Strikers for 4 or 3 point strikes? I’d be grateful if you could point out what I missed in my understanding of the mechanics, Jake, since obviously you’ve put much more thought on the matter than I have. Thanks for your insight and for your previews of Season 2 on the blog! Thanks Erick, that’s an excellent analysis. Trontek teams are good, and this was actually something that I sought to achieve. Very often the datum (usually human) faction in a game is weak and uninspiring. I wanted to ensure that the humans were a viable long-term option in DB. They are OK at everything, which means that they are generally better at something than every other team, though what this “something” is varies. During playtesting the bugs had problems against some teams but still won about half their matches. Let me add a couple more thoughts to the pot. The DB database is an excellent tool and will be, I think, even more useful going forward. However, your worries are based in part on the assumption that the teams are playing on an even playing field. I think they aren’t. WIth two teams in the box you are always going to see more of them than the others. Of the teams in the core set the humans are by far the easier team to use. This means that you’re going to get a bunch of results where the Trontek Coach is ahead of the Marauder Coach on the learning curve and therefore winning more often. The game is still very young, and so we’re not yet dealing with a database full of games played by Coaches who understand their teams as well as each other – the easier to learn the team, the better it will do in the early stages. I think this is a major factor in the current numbers. If I’m right then we would expect to see the trend of the numbers being towards a more even spread, and we do. On the results tracker (http://db.chezalex.net/dbdatabase.html) compare the results for all games vs the last 100. Trontek are coming down and the others catching up. The numbers will only give a true reflection of the relative potencies of the teams when they are stable. Another thought is whether you are comparing them in one-off games or league play. I think that the Z’zor will not be as good in one-off games as they are in leagues because one of their major plus points is their survivability. That counts for quite a lot in leagues but as you suggest is less useful in single games. It isn’t entirely without merit though, as having more players on the pitch means that the opposition has, at the vey least, to Evade more often, and every time you make them roll you introduce a chance for them to land on their faces. Sorry Erick, that sounds painful. sounds interesting … any chance the bugs can grow wings for a special straight forward move !!! the skill issue in this game is a real head turner and makes a huge differance in single games, we play mostly single games, is there any chance in version 2 or 3 there will be a custom team designer where we can build teams for single games and include the MVP’s ? with min max on player types. have a look at the rules for Exhibition games on page 50 of the rules: that’s what you’re talking about.